ROAD TEST: Range Rover Sport "Stormer"
Land Rover stormed the market way back in 1972 with the original luxury 4x4. It was known, simply, as "Range Rover". It became an instant success, demonstrating that a distinct demand existed for more than just your basic 4x4. Since then the world has witnessed an 'avalanche' of models in the new market segment which we'll call luxury 4x4s. Of course many manufacturers claim originality for certain vehicles. Some claims are just 'spin' (so to speak), but not so with the Range Rover. It was clearly the original luxury 4x4. Since its early success, the famous British brand has continued to pave the way with luxury 4x4s by the regular introduction of new models and, importantly, expanding the model line-up. Each new model has the clearly identifiable "Range Rover" styling effect. 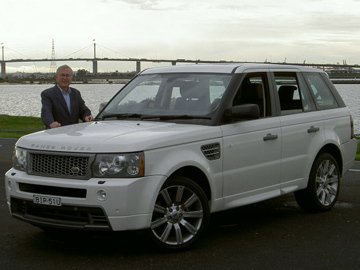 An important strategy for Land Rover was to expand the appeal of their luxury brand. In reality, this was an essential requirement because the original model, since renamed "Vogue" was continually moving further and further upmarket to remain ahead of numerous new comers to the market. 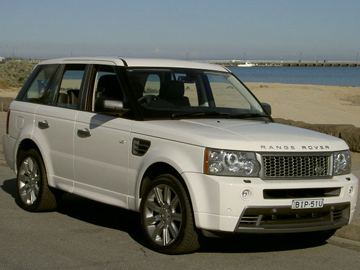 The introduction of the Range Rover Sport in 2005 must be viewed as an all-conquering move. It put the new smaller Range Rover in front of a broader group of buyers and, again, became an instant success thus repeating the story of the original Range Rover. 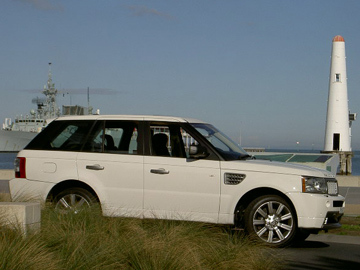 Next Car road tested a Range Rover Sport in Melbourne recently, covering some 576 kms. The version chosen for the test was the recently introduced "Stormer" edition. The test 'car' was fitted with the popular V8 turbo diesel. The "Stormer" pack adds 'Stormer' front and rear bumpers, extended rear spoiler, body coloured side cladding, chromed rectangular exhaust finishers, honeycomb radiator grille and front park distance control (PDC). The "Stormer" pack adds $9,990* to the $118,900* price of the Range Rover Sport TDV8. The Range Rover Sport range includes variants both above and below the price of the TDV8. The V8 provides excellent performance. This aspect will certainly impress those who remain sceptical about a diesel engine's ability to perform. Statistically, the engine provides 200 kW of power @ 4,400 rpm and the maximum torque is a particularly worthwhile 640 Nm. But there is more to appreciate than the performance of the Range Rover Sport. The interior is comfy and stylish. A rather neat looking white stitching is a feature of the black leather trim, although the light coloured headlining looks out of place. Passengers in the rear will appreciate the available space for their comfort. A unique feature is the lift-up glass in the tailgate, which is handy when you don't need the entire open. Other worthwhile features include four-way steering wheel adjustment, user-friendly cruise control, a driver's footrest and handy front door pockets. Although the first class off-road capability of the Range Rover is well known, I didn't take the "Stormer" into the 'jungle' on this occasion. However, during the road test I visited the perceived home of luxury 4x4s, Toorak. Whilst there I couldn't help but notice that the Range Rover Sport is, indeed, popular in this part of the world. And why wouldn't it be. With an excellent design, a stylish presentation, all the features that are important, together with a reasonable price tag backed by one of the most respected brands in the world, the Range Rover Sport "Stormer" fulfils all the requirements of a luxury 4x4s. Additionally, it drives well and is fuel efficient. NOTE: * The prices mentioned in this article are approximate and are based on the manufacturers recommended price which excludes dealer delivery fee and the various statutory charges. Drive-away prices are available from a Land Rover/Range Rover dealer. As always, prices are subject to change without notice.